Port Saint John has signed a long-term lease agreement with DP World for the operation of the west side container terminal, the largest private sector investment in the port in decades. Port Saint John CEO was among the officials who announced the landmark deal on Thursday. 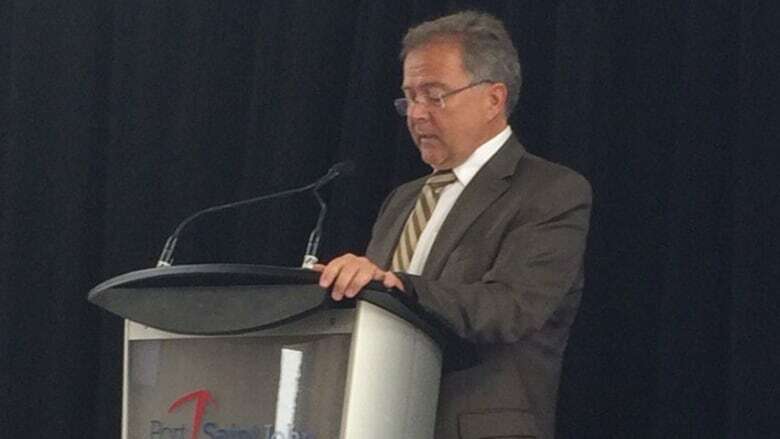 (Port Saint John)"Our waterfront and our port is where our story began, and is where our future begins," Port CEO Jim Quinn said during the announcement at the Marco Polo cruise terminal on Thursday morning. "We are pleased to join together with a global trade partner who shares our vision for the growth potential of this port based on its geographic location and rail optionality," said board chair Peter Gaulton. The lease, which takes effect on Jan. 1 and will continue for about 30 years, comes on the heels of funding commitments from the federal and provincial governments for the $205-million upgrade of the west side terminal to accommodate larger vessels and an increase in traffic. DP World, which is based in Dubai and is one of the largest marine terminal operators in the world, will also introduce new assets, including revamped terminal cargo handling equipment, officials said. "We are delighted to have a presence on the east coast of North America for the first time and see great growth potential," DP World's CEO and group chairman Sultan Ahmed Bin Sulayem said in a statement. DP World currently owns or operates 77 marine and inland terminals in 40 countries around the globe and employs 37,000 people worldwide. In Canada, it has operations at the ports of Prince Rupert, Vancouver and Nanaimo. "We believe that the future growth prospects for the [Saint John] port are strong and we are excited to be participating with Saint John Port Authority in their expansion plans," he said. The west side terminal overhaul will see the Rodney and Navy Island terminals consolidated and modernized over the next seven years. The project will include creating a 25-acre area for container storage, turning 10 acres into a multipurpose yard and using the other approximately 25 acres for terminal access roads, stevedoring operations, trans-loading and cargo-consolidation warehouses, and lay-down areas for break-bulk and project cargoes. The main channel is also expected to be deepened to 10 metres at low tide, from the current 8.4 metres. Nearly 2,000 jobs will be created throughout the project, with a $152-million boost to the gross domestic product, Premier Brian Gallant has said.